Over the past two decades I've crossed the Interstate 5 corridor from Los Angeles north over the Sierra Pelona Mountains and Tehachapi Range to San Joaquin Valley what seems to be an immeasurable number of times. While Interstate 5 from Castaic Junction to Grapevine via Tejon Pass today is known to most as "The Grapevine" it occupies a corridor which has been traversed by numerous historic highways. The most notable of these highways is known as the "Ridge Route." This article is dedicated to the Ridge Route and the various highways that preceded it. The Ridge Route is a 44 mile section of highway which was completed in 1915. The Ridge Route originally stretched from Castaic Junction north over Liebre Summit and Tejon Pass to the tiny community of Grapevine. In spite of a roadway that once utilized nearly 700 curves the Ridge Route is generally considered far ahead of it's time and one of the first modern highways constructed for automotive use. The following is a history of transportation along the Ridge Route corridor dating back Spanish Las Californias. Before I begin, the vintage photos I'm using in this blog aren't my own and mostly were borrowed from various online sources. To that end, I attempted to match as many of my own photos to the vintage photos as I could. There are also several websites pertaining to the Ridge Route and other highways which I found useful while putting this blog together. A site created by Harrison Scott dedicated to preserving the history of the Ridge Route and the actual roadway itself. The website contains historical information regarding the Ridge Route, a map, an assortment of Ridge Route related photos and a page for a periodic Ridge Route tour. There is a sub-link page containing various other topical links for the Ridge Route. Ridgeroute.org links over to the Ridge Route Preservation Organization site. The Ridge Route Preservation Organization is current presided over by Michael Ballard and includes various other members (including Harrison Scott) who have been working to preserve the Old Ridge Route. Ridgeroute.org contains a Ridge Route historical timeline and various documents related to the highway such as the 1934 relinquishment and listing on the National Register of Historic Places. Socalregion.com is a website that is largely oriented towards Southern California area. Socalregion is hosted by Michael Ballard and has varying topics about the area such as; geology, highways, recreation, history, historical maps, images, railroads, wineries and a couple other topics. The link posted above directs to a Socalregion Virtual Tour of the Ridge Route. I was not aware of the relvancy of the Socalregion page regarding many of the topics covered in the original draft of this blog and thought it should be included. California Highways preserves the legislative history of California State Highway system. The website includes actual legislative references for each State Highway and various other important information as it pertains to highway transportation in California. The legislative information is something that I have almost always used when writing about highways in California that involved State Maintenance. Movement towards a modern automotive crossing between Los Angeles and San Joaquin Valley really didn't begin until the State got involved with Legislative Route Number 4. USends is dedicated to the purpose of documenting the historical endpoints of all the US Routes. US Ends includes actual map illustrations showing the historical alignments of the US Route system. 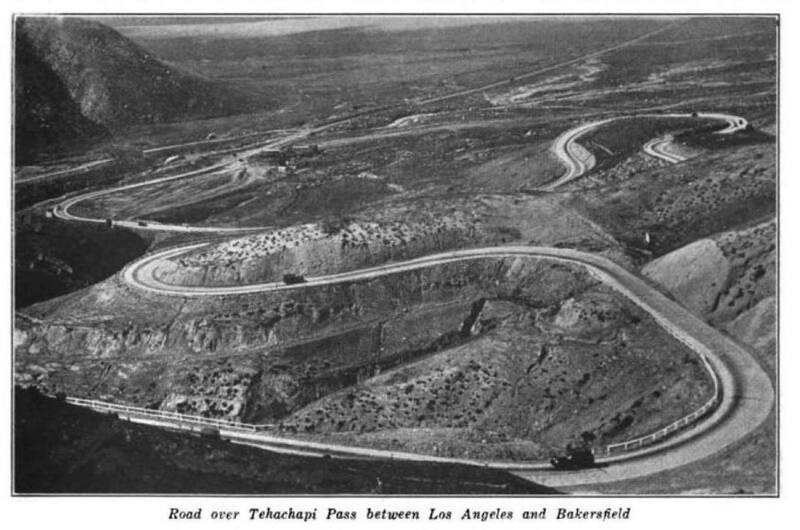 USends was useful regarding finding out exactly when US Route 6 was extended to Long Beach and by proxy Newhall Pass. Elsmerecanyon.com on "The Old Road"
Elsemerecanyon posted a map of the El Camino Viejo which was published in the book "El Camino Viejo Los Angeles - The Oldest Road of San Joaquin Valley" which can be found on the above link. The map details the full route of the El Camino Viejo from Los Angeles north to San Francisco Bay. The above link is a map set of official State Highway Maps published by the California Division of Highways and Caltrans. The maps largely span most years from 1918 up to 2005 and are one of the best sources to find actual year-by-year data for State Highway maintenance. The above link is a map set from the California Division of Highways on the County level for 1935. The maps show what routes were under State Maintenance during 1935 in addition to major County Highways. 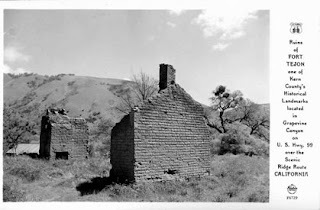 The above link is a previous blog I wrote on Surewhynotnow regarding the Millerton ghost town and Stockton-Los Angeles Road. I went into detail regarding the major river crossings along the Stockton-Los Angeles Road in addition to the general routing. There is a 1857 map of California linked on the blog which shows the major roadways of the time which include the Stockton-Los Angeles Road. The above link is for the Wildlands Conservancy Wind Wolves Preserve which is located on part of the El Camino Viejo in San Emigdio Canyon. The Wildlands Conservancy is a non-profit nature preserve system located in California which began in 1995. Fort Tejon was a frontier U.S. Army outpost which occupied from 1854 to 1864. Fort Tejon played a key part transportation through Grapevine Canyon. The website is a little sparse on information related to transportation but there are various displays located at the park itself. Before the Ridge Route and American California the landscape of Spanish Las Californias was far different than today. Europeans living in Las Californias largely occupied communities along the coastline which were for the most part were attached to one of the twenty-one Catholic Missions. The Missions were stringed together by a road know as the El Camino Real ("The Royal Road") which stretched from Mission San Diego de Alcala in present day San Diego north to Mission San Francisco Solano de Sonoma in modern day Sonoma. Los Angeles was no different having been founded in September of 1781 as El Pueblo de Nuestra Senora la Reina de los Angeles in close vicinity to Mission San Gabriel Arcangel. Mission San Gabriel Arcangel itself was founded in 1771. Given that the Spanish Missions were located along the coast the majority of travel in Las Californias was along the El Camino Real. Travel into the interior of Las Californias through San Joaquin Valley was a difficult prospect given the lack of civilization and more so the Tule Marshes of; Kern Lake, Buena Vista Lake, Tulare Lake and the San Joaquin River. That said, travel inland to the San Francisco Bay Area from Los Angeles was desired by some which led to the creation El Camino Viejo ("The Old Road") which was in common use as early as 1780. The El Camino Viejo is sometimes called "El Camino Viejo Los Angeles" and simply translated as "The Old Road." The El Camino Viejo was the first European route from Los Angeles to San Joaquin Valley. From Los Angeles the El Camino Viejo continued northward into San Fernando Valley and to Mission San Fernando Rey de Espana. From San Fernando Valley the El Camino Viejo ascended into the Sierra Pelona Mountains. The El Camino Viejo entered San Francisquito Canyon to San Francisquito Pass where it emptied into Antelope Valley in the western flank of the Mojave Desert near Elizabeth Lake. Upon entering Antelope Valley the El Camino Viejo turned west along the San Andreas Fault to what is modern day Gorman where it intersected part of what would become the Ridge Route. Unlike the Ridge Route which turned north into Tejon Pass to reach San Joaquin Valley via Grapevine Canyon the El Camino Viejo continued west into Cuddy Canyon of the San Emigdio Mountains. The El Camino Viejo continued to follow the San Andreas Fault through Cuddy Canyon before descending into San Joaquin Valley via San Emigdio Canyon near the shores of Kern Lake. The El Camino Viejo continued northward along the western shore of the Tulare Lake watershed following the general path of modern California State Route 33. The El Camino Viejo continued to serve Las Californias until the Mexican War of Independence. Las Californias became a Mexican Territory in 1821 and was renamed to Alta California in 1824. Mexican governance brought further civilization to San Joaquin Valley but it largely remained a remote landscape with few changes to the El Camino Viejo. Everything would change following the discovery of Gold in Sutter's Mill along the South Fork American River in the Sierra Nevada Range in January of 1848. In February of 1848 the Treaty of Guadaluple Hidalgo was ratified which ceded Alta California to the United States at the conclusion of the Mexican-American War. By March news of the discovery of gold at Sutter's Mill was published by newspapers in San Francisco. The New York Herald published their article on the gold discovery in August of 1848 bringing widespread attention to the newly acquired Californian territory. Later, U.S. President James Polk spoke of the gold discovery in California in December 1848. By 1849 the California Gold Rush had begun which spurred growth throughout California. A large percentage of the influx of settlers made their way to the Sierra Nevada Range to take advantage of the plentiful mining claims. California itself would become a State in 1850. Although the California Gold Rush was mainly centered around the northern extent of the Sierra Nevada Range it was wasn't long before additional claims were made further south. By 1853 gold claims were struck along the Kern River which led to the Kern River Gold Rush. At this point the entirety of the Sierra Nevada Range had become attractive for prospectors looking to make money on the new mining claims. The El Camino Viejo being routed west of the Tulare Lake watershed was suddenly no longer a viable route for the majority of travelers through San Joaquin Valley. A new route from Stockton to Los Angeles following the Sierra Nevada Foothills along the eastern edge of San Joaquin Valley which was created known as the Stockton-Los Angeles Road. In San Joaquin Valley the path of the Stockton-Los Angeles Road followed the general path of California State Route 65, particularly north of the Kern River. Originally the Stockton-Los Angeles Road utilized an established path from San Joaquin Valley south over the 5,285 foot Old Tejon Pass in the Tehachapi Mountains to Antelope Valley. At the time Old Tejon Pass was simply known as "Tejon Pass" and was an ancient Native American Trail used to traverse the Tehachapi Mountains. In 1772 by Spanish Explorers surveyed Old Tejon Pass and the route became an established way of reaching eastern San Joaquin Valley. Old Tejon Pass was later used by the Jedediah Smith expedition of Alta California in 1827. In 1853 Castac Pass through Grapevine Canyon west of the Old Tejon Pass was surveyed by Robert S. Williamson of the Army Corps of Engineers for a possible path of Transcontinental Railroad. The 1853 surveying expedition found Castac Pass through Grapevine Canyon to be a far more viable route for travelers and the primary alignment was of the Stockton-Los Angeles Road was shifted west from Old Tejon Pass. Castac Pass had a far lower terminal elevation at 4,144 feet above sea level and had a gentler grade through Grapevine Canyon. 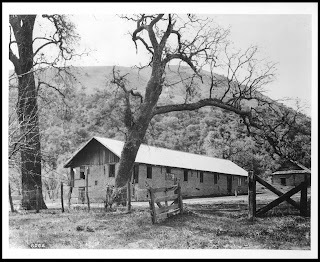 In 1854 a U.S. Army Garrison was established at Fort Tejon in Grapevine Canyon near modern Lebec to protect settlers and travelers along the Stockton-Los Angeles Road. In time Castac Pass became known as Fort Tejon Pass and eventually simply Tejon Pass. 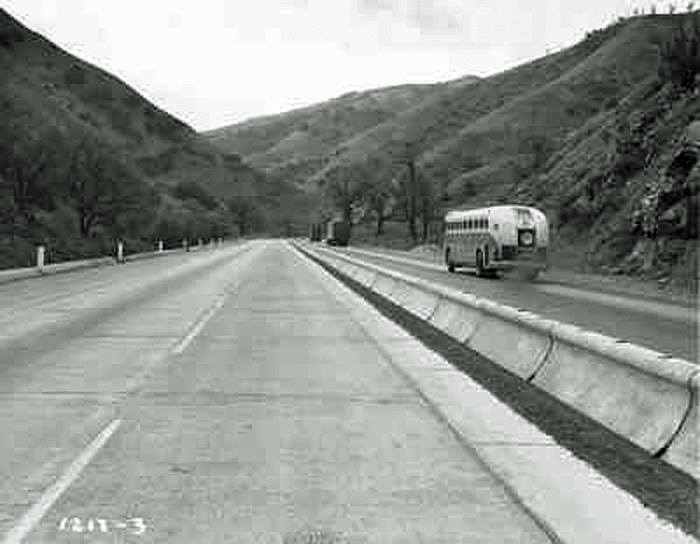 Tejon Pass would later become part of the Ridge Route alignment and Interstate 5. This 1857 Highway Map of California shows all the major routes traversing the mountains between San Fernando Valley and San Joaquin Valley. I highlighted the Cuddy Canyon alignment of the El Camino Viejo, the path over Old Tejon Pass, and the primary route of the Stockton-Los Angeles Road over Tejon Pass. The route of the El Camino Viejo and Stockton-Los Angeles Road south of Antelope Valley took an identical path through San Francisquito Canyon to San Fernando Valley. Travel on the Stockton-Los Angeles Road from San Joaquin to San Fernando Valley was gradually improved over the ensuing decades but the route continued to utilize San Francisquito Canyon. San Fernando Pass was gradually improved by toll road franchise holders who cut a deep slot for wagons to cross. The cut in San Fernando Pass was obtained by surveyor Edward Beale (who also played a major part in the location of Fort Tejon in Grapevine Canyon) in 1863 who deepened it to 90 feet. The cut in San Fernando Pass would come to be known as Beale's Cut and is still present east of the Sierra Highway and Newhall Pass (the modern name of San Fernando Pass). This photo (which is actually reversed from the original) dated from 1872 shows wagon being pulled up Beale's Cut by horse. In San Joaquin Valley much of the route of the Stockton-Los Angeles Road was gradually replaced when the Central Pacific Railroad constructed a line along the modern US Route 99 (California State Route 99 in modern times) corridor to Tehachapi Pass. The advent of the Central Pacific Railroad founded many of the modern communities of San Joaquin Valley and brought flood control measures which helped ebb the wildly varying flood plains of the Tulare Lake watershed. None of these measures did much to improve the routing of the Stockton-Los Angeles Road between San Joaquin Valley and San Fernando Valley. Through much of the 19th Century the State of California was reluctant to get involved with highway building and maintenance. Much of the road building infrastructure was granted by the State Legislature to Franchise Toll Road companies. Typically a Franchise Toll Company would build and maintain roadways for a period of ten years. The trouble was that at the end of the toll franchise maintenance on roadways was deferred often back to the county level which led to varying standards of maintenance quality. Such a system was far from adequate for the emergence of the automobile. In 1895 the State Legislature created the Bureau of Highways. 1895 was also significant year due to Legislature authorizing acquiring the Lake Tahoe Wagon Road to be maintained as the first true State Highway. Although there was various acts related to highways made by the State Legislature in the ensuing decade the next significant change would be during the 1909 First State Highway Bond Act. The 1909 First State Highway Bond Act was approved by voters in 1910 which added 3,052 miles of roadways to the State Highway system. One of the routes included in the 1909 First State Highway Bond Act was a new 359 mile long State Highway from Sacramento to Los Angeles. 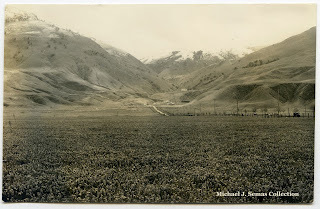 This highway was the genesis point of the Ridge Route and was eventually assigned Legislative Route Number 4 in 1916. I should note that the legislative history I'm describing has been researched by Daniel Faigin of CAhighways.org. A full Chronology of the State Highway system and the applicable legislative acts can be found in chapter format on CAhighways.org. By 1910 travel between San Fernando Valley to San Joaquin Valley was still made over the routing of the Stockton-Los Angeles Road. 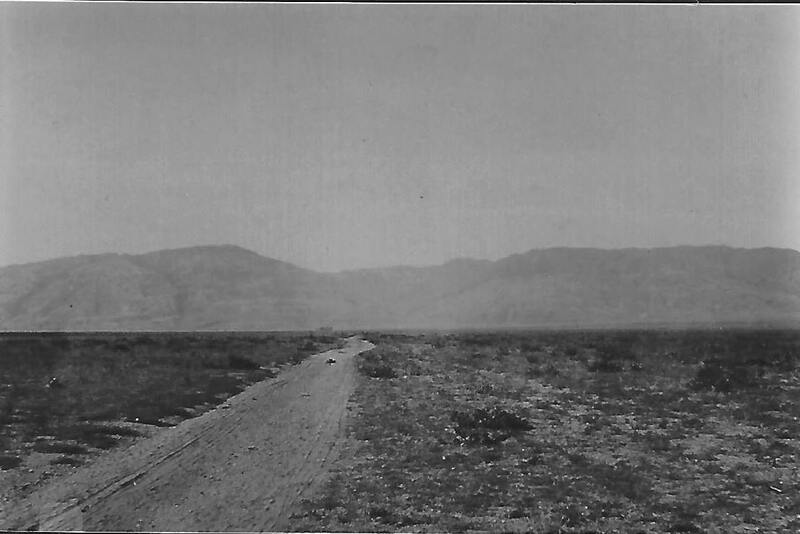 Such an alignment still required use of Beale's Cut, the rest of the route was not much better as this 1912 view south on LRN 4 towards Grapevine Canyon can attest to. The first major change to the routing of LRN 4 between San Joaquin Valley and San Fernando Valley was made at Newhall Pass. By early 1909 just prior to the 1909 First State Highway Bond Act the Los Angeles County Highway commission posted a bond for the construction of the Newhall Tunnel to replace Beale's Cut. 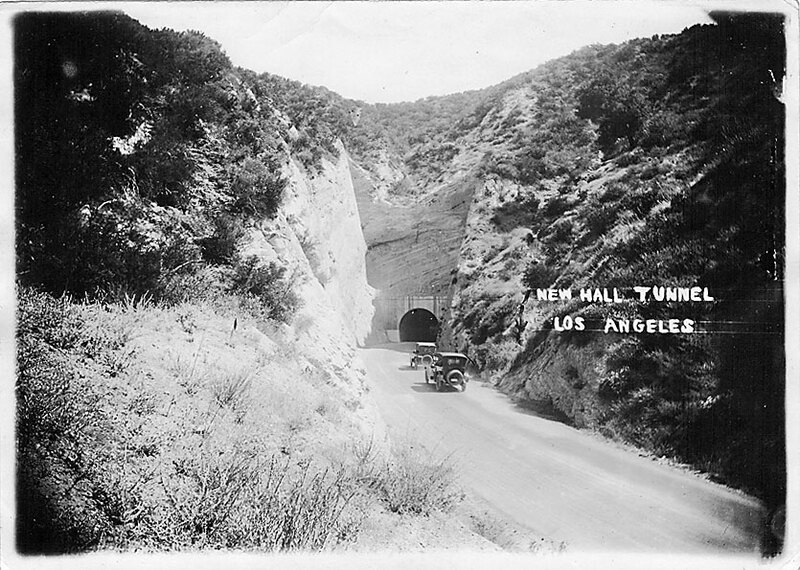 The Newhall Tunnel was completed in December of 1910 and would remain in place until Newhall Pass was bored out in 1939. At the time the Newhall Tunnel was completed LRN 4 used San Fernando Road (Sierra Highway) through the Newhall Tunnel and took a turn northward on Newhall Avenue to Newhall. As stated above the actual alignment of the Ridge Route was defined as running from Castaic Junction north to Grapevine. Various alignments for LRN 4 were considered but ultimately most of them were rejected due to concerns over landslides in the canyon grades. Ultimately a route running along the ridges of the Sierra Pelona Mountains via Liebre Summit to Antelope Valley was chosen which was the ultimate path of the first alignment of the Ridge Route. Ironically Piru Gorge to the west had been considered which ultimately would later become Ridge Route Alternate. Construction of the Ridge Route began in 1914 and was one of the first by the California Highway Commission. The Ridge Route was an ambitious project which had a consistent 6-7% grade between Castaic Junction and Grapevine. The 6-7% grade of the Ridge Route required use of 697 curves throughout the 44 mile alignment. The unpaved Ridge Route opened in October of 1915 and reduced the expect travel time between Los Angeles to Bakersfield to a 12 hour drive. What was once a journey that would take several days on the Stockton-Los Angeles Road was now possible in less than one on the Ridge Route. This 1917 Automobile Club of Southern California map shows the Ridge Route when it was still new between Castaic Junction north to Grapevine. While the Ridge Route is most often associated with being part of the initial routing of US Route 99 it's first signed route was actually National Part-to-Park Highway. The National Park-to-Park Highway was an Auto Trail which was signed between the majority of the western National Parks. The National Park-to-Park Highway can be seen on the Ridge Route on the below 1924 Rand McNally Road Atlas of the western United States. Paving on the Ridge Route would begin by 1917. The Ridge Route was paved with concrete slabs which were designed to have a long maintenance life and handle the heavy weight of commercial traffic. The paving of the Ridge Route was delayed by World War 1 was but ultimately was completed by 1921. Asphalt was added to the Ridge Route between 1922 and 1924 which straightened many of the 697 curves. Despite the improvements it was clear the Ridge Route was becoming inadequate to handle traffic loads as it was assigned to the routing of US Route 99 of the new US Route system in 1926. Despite being designated in 1926 the US Routes in California were likely not signed in-field until 1928. US 99/LRN 4 from the south end of the Ridge Route at Castaic Junction through Newhall Pass originally had been routed on; (what is now) Magic Mountain Parkway, Railroad Avenue, Newhall Avenue, and San Fernando Road. In 1931 a new routing of US 99/LRN 4 bypassing Newhall Pass, Saugus and Newhall to Castaic Junction was constructed through Weldon Canyon on what is now known as The Old Road. The former alignment of US 99/LRN 4 from Castaic Junction through Saugus and Newhall was partially reused as part of US 6/LRN 23 when it was routed to Long Beach in 1937. US 6/LRN 23 entered Saugus via Soledad Canyon Road on the south bank of the Santa Clara River to Bouquet Canyon Road. From Bouquet Canyon Road US 6 turned south towards Railroad Avenue and downtown Newhall. 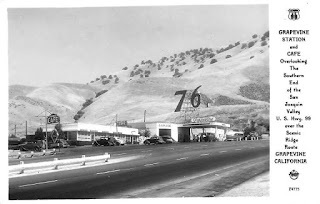 US 6/LRN 79 followed Railroad Avenue and Newhall Avenue to San Fernando Road to reach Newhall Pass. Former LRN 4 in from Castaic Junction to US 6/LRN 23 in Saugus was assigned to LRN 79 in 1939 according to CAhighways.org. 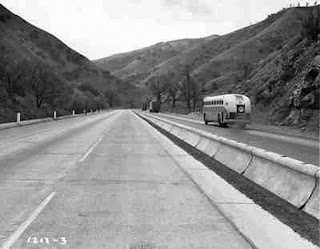 In 1940 US 6/LRN 23 bypassed Saugus and Newhall on a more more direct route to Newhall Pass on the new Sierra Highway. Although the legislative definition of LRN 79 wasn't extended to Sierra Highway and US 6/LRN 23 until 1957 it was maintained as a State Highway through Newhall nonetheless. LRN 79 was reassigned as part of CA 126 in 1964 and remained in the State Highway system until 2001. 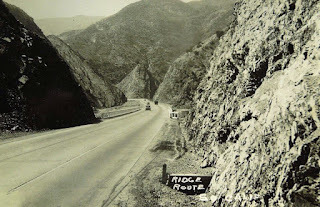 In 1929 a new alignment of the Ridge Route was selected to traverse through Piru Gorge which would shorten the highway by 9.6 miles and bypassed most of the 6-7% concrete lined grades on the ridges of the Sierra Pelona Mountains. 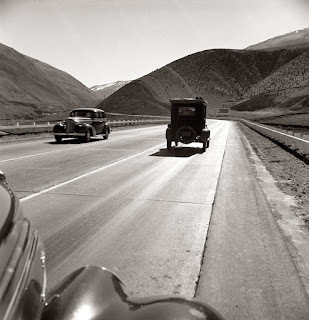 This new alignment was known as Ridge Route Alternate and was completed through Piru Gorge to Tejon Pass by late 1933. The Ridge Route Alternate grade was three-lanes with the center lane (known as a "suicide lane") reserved for passing. The original alignment of the Ridge Route north from Tejon Pass to Grapevine was bypassed by a similar grade in 1936. Sometime between 1934 and 1936 the original Ridge Route along the ridge of the Sierra Pelona Mountains was relinquished to Los Angeles County for maintenance. The first map below shows the planned route of Ridge Route Alternate in 1932 west of the Ridge Route. The second map shows both the Ridge Route and Ridge Route Alternate under State Maintenance before the former was relinquished. The third map from 1936 shows Ridge Route Alternate as the only iteration of the Ridge Route under State Maintenance. 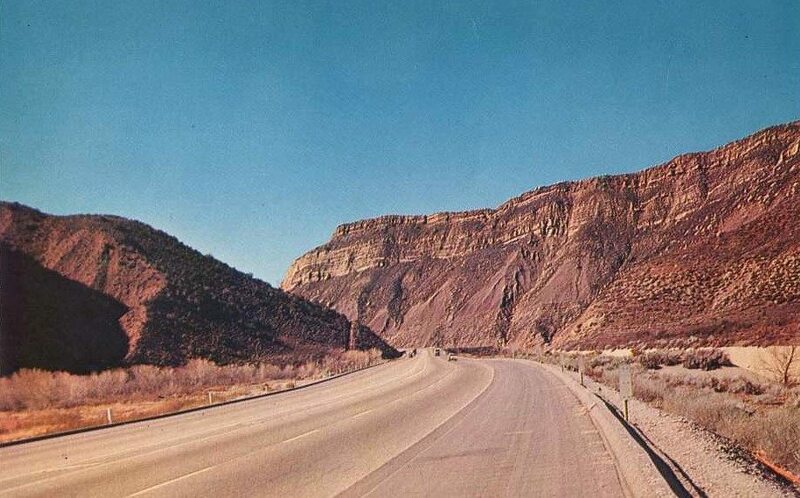 Ultimately Ridge Route Alternate was built out to a four-lane expressway grade in the late the 1940s and early 1950s. Ridge Route Alternate/US 99 despite being a full expressway grade still had numerous at-grade intersections. As traffic volumes increased in the 1940s it was quickly becoming apparent than even Ridge Route Alternate/US 99 was inadequate due it being the primary route between Los Angeles north to San Joaquin Valley. The next change in the story of the Ridge Route would come with the Federal Highway Aid Act of 1956. The Federal Highway Aid Act of 1956 authorized the creation of the Interstate Highway System of freeways. Unlike the US Route system the Interstate Highway System consisted fully of freeway grades (a few substandard sections and surface portions were grand-fathered into the system) which had strict adherence to guidelines pertaining to maximum grade steepness and lane width. 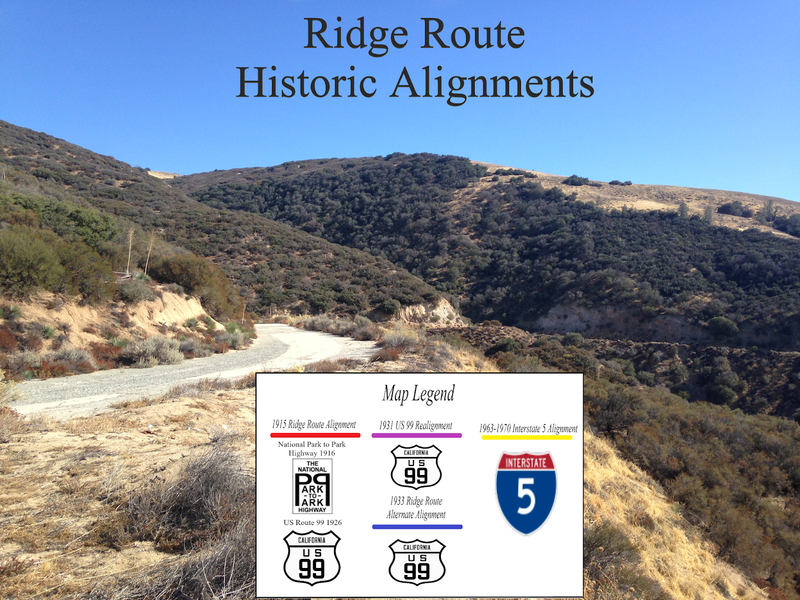 While much of Ridge Route Alternate was ultimately incorporated into Interstate 5 it was clear that the alignment through Piru Gorge had to be replaced. The 1966 State Highway Map below shows the planned routing of Interstate 5 east of Piru Gorge. Interstate 5 would be completed from Castaic north to Grapevine by mid-year 1970. Unfortunately I haven't been able to find a map from 1971 showing the completed I-5. On the 1970 State Highway Map I-5 is shown on a temporary alignment through Piru Gorge on Ridge Route Alternate just before it's new grade to the east was completed. Oddly the common terminology used to describe I-5 between Castaic Junction and Grapevine ultimately became "The Grapevine." Personally I find this somewhat odd considering that the majority of I-5 uses the right-of-way of the original Ridge Route and Ridge Route Alternate. 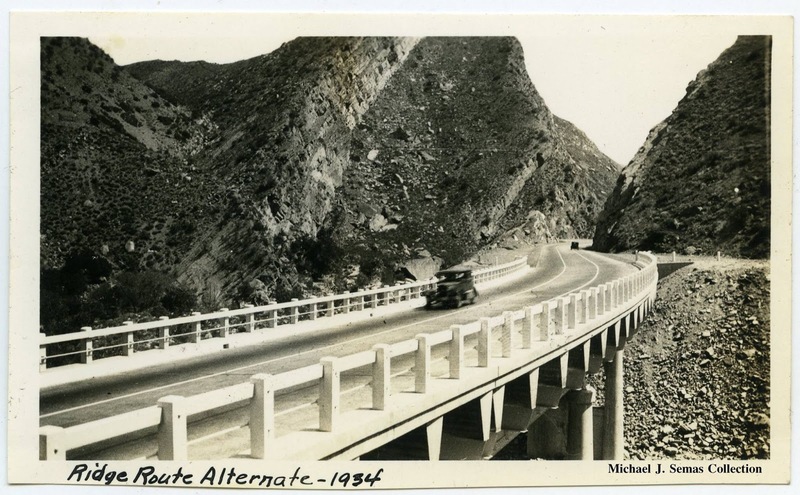 A common theory on why the route of I-5 became known as "The Grapevine" is a combination of route traversing Grapevine Canyon and the physical shape of the southbound lanes crossing the northbound twice near Castaic Junction resembling an actual vine. Regardless I-5 from Castaic Junction north to Grapevine retains much of the scenic beauty and engineering wonder from the original Ridge Route in addition to Ridge Route Alternate. Ridge Route Alternate through Piru Gorge was said to be one of the most beautiful sections of State Highway in California. Unfortunately most of Ridge Route Alternate in Piru Gorge was flooded over by the Pyramid Dam project which created Pyramid Lake in 1972. That said, Ridge Route Alternate can still be accessed from the Templin Highway north on Golden State Highway to the foot of the Pyramid Dam. One of the goals I had in mind for this project was to map out all the alignments of the Ridge Route from 1915 up to modern Interstate 5. I used USGS maps from historicaerials.com and Division of Highways Map scans from the David Rumsey collection to get an accurate placement of the Ridge Route alignments. The image below notes the map legend with color coding for each Ridge Route alignment. My map images progress from Newhall Pass northward to Grapevine. The first map shows original alignment of US 99/LRN 4 over Newhall Pass compared to the later route through Weldon Canyon. The location of Beale's Cut is marked just east of Newhall Pass. The second map shows the original alignment of US 99/LRN 4 on Newhall Avenue and Railroad Avenue through downtown Newhall. The 1931 alignment of US 99/LRN 4 is shown on The Old Road immediately west of I-5. The third map shows the convergence point of the 1909/1931 alignments of LRN 4 at the intersection of Magic Mountain Parkway and The Old Road just south of the Santa Clara River. The original intersection was obliterated during the construction of I-5. This map below shows where Ridge Route Alternate would have met the original Ridge Route alignment in Castaic. Ridge Route Alternate continued northward on Castaic Road where it merges in with the northbound lane of I-5. The original alignment of the Ridge Route crossed what is now I-5 on an obliterated alignment. North of Castaic some of the original Ridge Route alignment can be found on Castaic Lake Drive. The southbound lanes of I-5 can be seen crossing back over to the proper position at Castaic Road. This map shows the southbound lanes of I-5 crossing over the northbound and following just to the east. The northbound lanes of I-5 were built over Ridge Route Alternate. The original Ridge Route is just above the southbound lanes of I-5 to the east. On the map below the original Ridge Route can be observed entering Angeles National Forest. The original Ridge Route in Angeles National Forest carries the designation of Forest Route 8N04. Ridge Route Alternate branches off from the alignment of I-5 at Templin Highway and continues northward towards Piru Gorge. On the map below I-5 is shown on a new alignment which differs from Ridge Route Alternate. Ridge Route Alternate still can be hiked to the foot of the Pyramid Dam in Piru Gorge. The original Ridge Route traverses through Swede's Cut which was the deepest excavation point on the first alignment of the highway. The map below shows where Ridge Route Alternate would have been located below the waters of Pyramid Lake. I-5 lies directly east of Ridge Route alternate on more suitable terrain for an Interstate. The original Ridge Route is on far higher terrain which was easier to maintain in the early 20th century. On the map below Ridge Route Alternate can be seen converging with the southbound lanes of I-5. The original Ridge Route passes through a National Forest gate near the ruins of the Tumble Inn which has generally been closed this past decade. On the map below I-5 is shown meeting California State Route 138. The original Ridge Route continued north over Liebre Summit which was the high point on the alignment at 4,233 feet above sea level. Near the ruins of the Sandberg Summit Inn the original Ridge Route is maintained by Los Angeles County. At Pine Canyon Road the original Ridge Route is traversed partially by Signed County Route N2 to California State Route 138. A small portion of California State Route 138 west to Gorman Post Road is on the original Ridge Route alignment. The original Ridge Route continued westward towards the community of Gorman. California State Route 138 and the original Ridge Route traversed Antelope Valley where they intersected the alignments of the El Camino Viejo in addition to the Stockton-Los Angeles Road. The original Ridge Route would have crossed over what is now I-5 on Gorman Post Road to Ralphs Ranch Road at Tejon Pass. From Tejon Pass the original Ridge Route would have followed Lebec Road northward into Grapevine Canyon. The El Camino Viejo split west close to Frazier Mountain Park Road whereas the Stockton-Los Angeles Road continued northward into Grapevine Canyon. Near Fort Tejon there is an older alignment of the original Ridge Route which would have crossed the I-5 alignment. From Fort Tejon north to Grapevine much of the original Ridge Route was obliterated by the 1936 Grapevine Canyon widening. There are some abandoned sections of the original Ridge Route alongside I-5 in Grapevine Canyon. The original Ridge Route emerges between the travel lanes of I-5 in Grapevine on Grapevine Road. The Grapevine was the north terminus point of the Ridge Route as US 99/LRN emerged into San Joaquin Valley. As stated above the route of the El Camino Viejo emptied out into San Joaquin Valley via San Emigdio Canyon. What I didn't know until recently was that San Emigdio Canyon was part of the Wildlands Conservancy Wind Wolves Preserve. The Wind Wolves Preserve actually offers free day hiking which includes part of the original path of the El Camino Viejo which was on the west bank of San Emigdio Creek. The below view is of San Emigdio Canyon looking south approximately from where Kern Lake was located. The entrance to the Wind Wolves Preserve is located on California State Route 166 about mile west of Old River Road. Turning south from CA 166 the mouth of San Emigdio Canyon can be seen a couple miles away. The service road to the Wind Wolves Preserve entrance is on the east bank of San Emigdio Creek and doesn't follow the El Camino Viejo. Either way one can almost envision wagons traveling south on the El Camino Viejo about to enter San Emigdio Canyon to traverse the San Emigdio Mountains. The Wind Wolves Preserve service road ends at the El Camino Viejo Trailhead at the mouth of San Emigdio Canyon. The El Camino Viejo Trail crosses to the west bank of San Emigdio Creek where it picks up the proper alignment of the El Camino Viejo. The grade of the El Camino Viejo in San Emigdio Canyon is very good and the El Camino Viejo Trail is very well signed for bike traffic. The El Camino Viejo Trail continues about another half dozen miles to the El Camino Viejo Wilderness Trailhead. The El Camino Viejo Wilderness Trail appears to reach Cuddy Canyon and Forest Route 9N05. San Emigdio Canyon was part of Mexican Rancho San Emigdio which was granted in 1842. During American period the Mexican Land Grant was honored but the land which made up Rancho San Emigdio was eventually transferred to Kern County by 1890. Suffice to say the view on the El Camino Viejo in San Emigdio Canyon certainly rivals Grapevine Canyon to the west. I'm not exactly certain when the Spanish declared the El Camino Viejo "official" but the Wind Wolves Preserve seems to imply from the historic placards that it was 1806. As stated above wagon carts were documented using the path of the El Camino Viejo as early as 1780. Before leaving the Wind Wolves Preserve I climbed up the Tule Elk Trail above the mouth of San Emigdio Canyon. The view from the rim of San Emigdio Canyon provides a panoramic view of what the El Camino Viejo would have looked like descending northward (right to left in the photo below) in San Joaquin Valley and Kern Lake. Compared to the rest of the historic highway alignments Old Tejon Pass is the most difficult to the reach. From southern San Joaquin Valley the path of the Stockton-Los Angeles Road originally ascended up Tejon Creek to Old Tejon Pass. Today the southern approach to Old Tejon Pass is largely inaccessible from San Joaquin Valley as much of Tejon Creek lies on private property. Old Tejon Pass and Tejon Creek can be approached on Sebastian Road but it can also be seen from the mouth of Grapevine Canyon in Grapevine looking eastward on clear days. Old Tejon Pass can be seen through much of Antelope Valley and especially from CA 138. Old Tejon Pass can be approached from CA 138 northward on 170th Street West. From 170th Street West and Starbuck Avenue there is a dirt road which ascends to northwest to Old Tejon Pass. I'm uncertain if Old Tejon Pass can be approached from this direction as much of the land surrounding it is part of a windmill farm. From the Old Ridge Route on Signed County Route N2 much of Antelope Valley and the Tehachapi Range can be seen. Old Tejon Pass is located in a crease in the Tehachapi Range located in a fold in the mountains near on the side side of the photo below. From Munz Ranch Road in Willow Springs Canyon about a half mile north of Elizabeth Lake looking northward the fold in the Tehachapi Range approaching Old Tejon Pass can be seen. Its easy to see why early American settlers used the route over Old Tejon Pass since it almost perfectly lined up with San Francisquito Canyon. Over the course of the past three years I've explored most of the original Ridge Route via car, running and hiking. I've often found it difficult to fully understand something in a historical context unless I've experienced first hand, the Ridge Route in that sense was no different. What I can say is that original Ridge Route is certainly worth experiencing in any form or fashion. In Grapevine as stated above there is an original segment of the Ridge Route on Grapevine Road between the travel lanes of I-5. Looking southward into Grapevine Canyon the grades of I-5 are somewhat obscured by the terrain giving the sensation that you've stepped back in time. Which is only accentuated further by applying a monochrome filter. There is a small culvert along Grapevine Road which may date back to the era of the Ridge Route. At a power transfer station there is an obvious former alignment of the Ridge Route as evidenced by the concrete slab jutting towards the northbound lane of I-5 on Lanny W. Reed Drive. The concrete slab above would have been the rough location where the Ridge Route began it's ascent into Grapevine Canyon. The mouth of Grapevine Canyon was originally the site of an Emigdiano Tribal village which was monitored by nearby Fort Tejon. To the east between Grapevine Canyon and the path to Old Tejon Pass the Sebastian Indian Reservation was plotted out in 75,000 acres in 1853. This reservation was shrunk to 25,000 acres in 1856 before being completed disbanded in 1863. This map from Fort Tejon State Historic Park shows the Emigdiano Village at the mouth of Grapevine Canyon, the Sebastian Reservation and another tribal village at the beginning of the ascent to Old Tejon Pass. Active roadways are shown through Grapevine Canyon and Old Tejon Pass. Grapevine was once part of the Butterfield Overland Mail Route as it operated from 1858 to 1861. 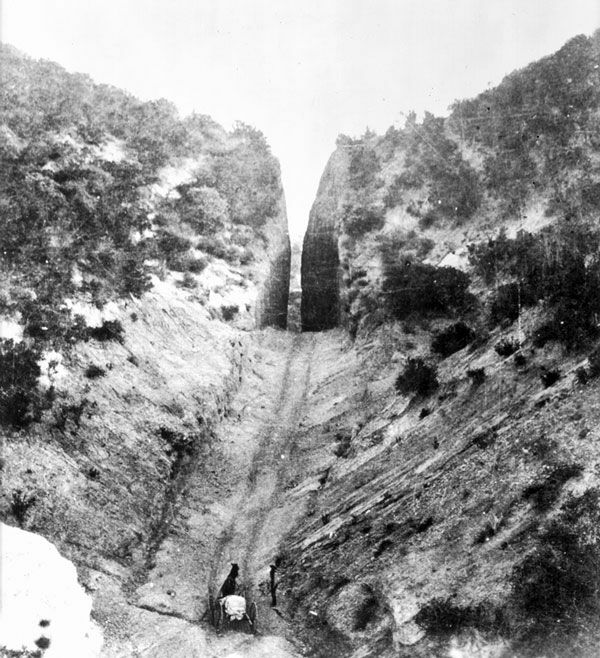 The Butterfield Overland Mail Route used the Stockton-Los Angeles Road through Grapevine Canyon as it passed by Fort Tejon. The Butterfield Station was located approximately one mile east of modern day Grapevine and the site was later reused as part of the 1875 adobe Rose Station. The Butterfield Overland Mail Route was transferred to Central Overland Trail in 1861 near the onset of the Civil War. In the heyday of the Ridge Route the path of Grapevine Road was lined with service stations and garages as evidenced by this photo below. 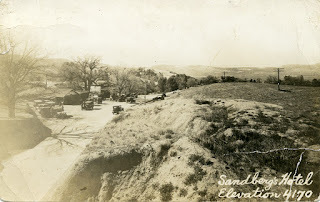 The bend in the Ridge Route on Lanny W. Reed Drive can be seen from this southbound view from the blooming flowers surrounding the mouth of Grapevine Canyon in 1927. As evidenced by the last map I posted Lanny W. Reed Drive ascends to a obliterated section of the Ridge Route traversed by the northbound lanes of I-5. Travelers on the original Ridge Route alignment would have had this view (from 1922) looking north into Grapevine and San Joaquin Valley. Within Grapevine Canyon there is very little evidence of the original Ridge Route until I-5 exit 210 at Lebec Road. I haven't been able to find many vintage photos of the Ridge Route in Grapevine Canyon other than when the roadway was expanded after 1936. The first photo is apparently from 1947 during the heyday of the Ridge Route expressway on US 99. Looking southward along I-5 through Grapevine Canyon offers a wide view of a massive highway grade. Grapevine Canyon was originally known as "Canon de las Uvas" in Spanish which translates to "Canyon of the Grapes." Documentation of the first European journey through Grapevine Canyon dates back to 1772 when it was named by the Spanish. At exit 210 the original Ridge Route can be followed on Lebec Road. Fort Tejon State Historic Park preserves the remaining structures of the Army fortification. Most of the buildings at Fort Tejon were restored from a state of ruin in the 1950s. The location of Fort Tejon was selected by Edward Beale (the same individual from Beale's Cut at Newhall Pass) who was selected as Superintendent of Indian Affairs in California in 1852. Originally the U.S. Army fortification was meant to be closer to the Sebastian Reservation but extreme summers of San Joaquin Valley were thought to be too extreme to maintain a garrison. Temperatures in Grapevine Canyon were heavily blunted in the summer time due to the high elevation which led to it being selected as the site of Fort Tejon. Fort Tejon could be visited a much more decayed state during the heyday of the Ridge Route. The first photo below is of the Main Barracks building in 1914 as the Ridge Route was being constructed. As stated above the original alignment of the Ridge Route on Lebec Road was on an abandoned concrete section which is next to the modern overpass. The Ridge Route looking southward towards Lebec and Cuddy Canyon. The El Camino Viejo would have split right heading northward to San Emidgio Canyon. South of Lebec the Ridge Route originally used Ralph's Ranch Road where it would have crossed into Los Angeles County. After entering Los Angeles County the alignment of Ridge Route crossed over what is now I-5 to the community of Gorman and Gorman Post Road. The first American settler in Gorman arrived in 1853 to set up a service station on the Stockton-Los Angeles Road. By 1858 Reed's Station was set up along the Stockton-Los Angeles Road which became Gorman's Station in 1867. Post Office Service began at Gorman's Station apparently in 1877. Looking northbound at Tejon Pass from Gorman Post Road the original alignment of the Ridge Route can be seen as the eye is directed by "END" signage. Continuing southward on Gorman Post Road the original Ridge Route alignment begins to approach California State Route 138 on the San Andreas Fault. The San Andreas Fault serves as a boundary line between the Tehachapi Mountains and Sierra Pelona Mountains. There is an abandoned concrete portion of the original Ridge Route at the end of Gorman Post Road. After Ridge Route Alternate was built and before I-5 was constructed California State Route 138 utilized Gorman Post Road to reach US 99. The original Ridge Route alignment follows California State Route 138 east into Antelope Valley on the San Andreas Fault before splitting southward again on Signed County Route N2. South from California State Route 138 the Old Ridge Route is open to vehicular traffic for seven miles to a gate in Angeles National Forest near the ruins of the Tumble Inn. The Old Ridge Route ascends quickly from California State Route 138 and has a wide vista view of Antelope Valley in addition to the San Andreas Fault. The Old Ridge Route continues to follow Signed County Route N2 across the boundary for Angeles National Forest. Signed County Route N2 splits away at the Angeles National Forest Boundary eastward on Pine Canyon Road. There is still National Forest guide signage on the Old Ridge Route south of Pine Canyon Road but it is marked with a closure stamp. There is a small historical sign detailing the history of the Old Ridge Route. Los Angeles County maintains the Old Ridge Route for about a half mile south of Pine Canyon Road. The Old Ridge Route south of Pine Canyon Road crosses by the ruins of the Sandberg Summit Inn. In the two photos below the Sandberg Summit Inn can be seen during it's heyday in the 1920s. The second photo is dated from 1920 looking northward. South of the Sandberg Summit Inn maintenance of Old Ridge Route switches to Angeles National Forest as Forest Route 8N04 southward towards Templin Highway. The Old Ridge Route is very loosely maintained and difficult to traverse in a car. I generally use the maintenance boundary as a trailhead to do some hiking or trail running on the Old Ridge Route. The concrete slabs installed between 1917 and 1921 are immediately obvious. The Old Ridge Route quickly ascends to the 4,233 foot Liebre Summit which as mentioned above is the high point on the original highway. Despite the blank historical markers Liebre Summit is still marked by the Forest Service. South of Liebre Summit the Old Ridge Route begins to descend and enters Horseshoe Bend. Descending southward the 1922-24 asphalt improvements to the Old Ridge Route are obvious. The asphalt alignments tend to be straight in nature whereas the original concrete often takes wider sweeping curves. I believe this gate once said "Locked Gate 5 Miles Ahead." The downward descent southward has a dramatic sweeping view of the Sierra Pelona Mountains. The Old Ridge Route approaches the ruins of the Tumble Inn which are obvious from the brick foundations and archway. 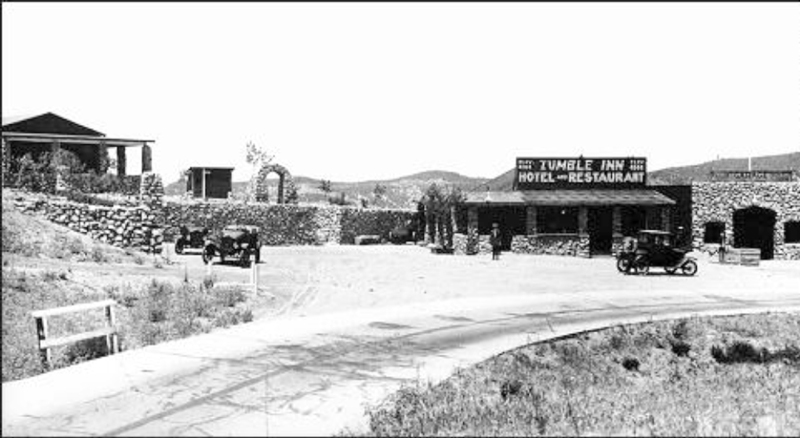 I was able to line up one of my photos of the Tumble Inn with one from the 1920s. I continued southward to the National Forest gate near the Tumble Inn which was surprisingly open. I'm not sure why the gate was open but I do know several people on the California Historic Highways Facebook have taken the Old Ridge Route all the way to Castaic the month this blog was originally published. - Gorman Post Road east from US 99 in Gorman. - Lancaster Road on modern CA 138 to Neenach. - Modern 245th Street West from Neenach to Lancaster Road. - Lancaster Road to Fairmont. - Lancaster Road from Fairmont to 120th Street West. - Avenue I to Sierra Highway/LRN 23 in Lancaster. LRN 59 dates back to the 1919 Third State Highway Bond Act and was defined as running from Lancaster to Baileys. 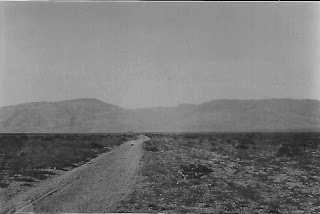 LRN 59 in it's original form can be seen between Gorman and Lancaster on the 1920 State Highway Map. 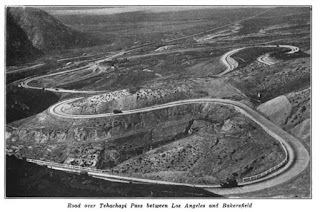 LRN 59 was later extended to Cajon Pass in 1931 and Lake Arrowhead in 1933 according to CAhighways.org. CA 138 was signed east of Lancaster on LRN 59 to CA 2 near Wrightwood. CA 2 continued on LRN 59 over Cajon Pass to Lake Arrowhead. The Signed State Routes first make an appearance on the 1938 State Highway Map. By 1956 CA 138/LRN 59 shown shifted onto Avenue D east from Neenach to US 6/LRN 23 north of Lancaster. This change can be observed by comparing the 1955 and 1956 State Highway Maps. According to CAhighways.org a new proposed alignment of LRN 59 was legislatively defined running along what is modern Signed County Route N2 from CA 138 at Quail Lake southeast to Palmdale. Ironically this would have put another part of the Old Ridge Route back into the State Highway system but it ultimately never happened. CA 138/LRN 59 from Quail Lake east to US 6/LRN 23 was given a new LRN 267 designation which can be seen on the 1960 State Highway Map. During the 1964 Highway renumbering the proposed route of LRN 59 between Quail Lake and Palmdale was assigned LRN 38. CA 138 to the north was assigned as part of LRN 48. As stated in Chapter 3 the path of CA 138 was eventually moved to a new freeway/expressway alignment which bypassed the Old Ridge Route alignment on Gorman Post Road. This new alignment appears to have been complete by 1967. Eventually plans to route CA 138 along Signed County Route N2 were abandoned and no longer appear on the most recent State Highway Maps. The most recent studies by Caltrans suggest that CA 138 will largely become a four-lane expressway between I-5 and CA 14. I-5 southbound on the Grapevine Grade past Gorman approaches the interchange with western terminus of CA 138. CA 138 continues as small freeway east to Gorman Post Road where it intersects it's original alignment on the Old Ridge Route. Lancaster is signed as being 46 miles to the east on CA 138. The original path of CA 138 on the Old Ridge Route along Gorman Post Road can be seen in Chapter 8. East of Gorman Post Road CA 138 rejoins the alignment of the Old Ridge Route to Signed County Route N2. The Old Ridge Route continues on Signed County Route N2 whereas CA 138 continues directly east into Antelope Valley. East of Signed County Route N2 Lancaster is signed as 41 miles away whereas Neenach is signed as 12 miles away. CA 138 east to Neenach is heavily traveled by truck traffic and signed as a Safety Corridor. It is interesting to consider that this path more or less follows the El Camino Viejo and Stockton-Los Angeles Road. Neenach was originally known as Cow Springs and was way point on both the El Camino Viejo in addition to the Stockton-Los Angeles Road. The original alignment of CA 138 cut south from Neenach towards the rim of Sierra Pelona Mountains at 245th Street West. The Sierra Pelona Mountains northern extent is formed from uplift from the San Andreas Fault. 245th Street West becomes Lancaster Road which continues to follow the southern end of Antelope Valley to Fairmont. Lancaster Road/Old CA 138 passes by Desert Woodlands State Park heading eastward to Fairmont. Desert Woodlands State Park protects a track of Joshua Trees which are endemic to the Mojave Desert which Antelope Valley is a part of. Lancaster Road/Old CA 138 continues through southern Antelope Valley eventually reaching Fairmont after passing through the Antelope Valley California Poppy Preserve. 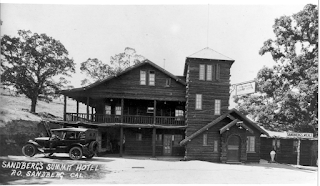 Fairmont is located near Mud Spring which was a water hole on the El Camino Viejo and State Station on the Stockton-Los Angeles Road. Lancaster Road east of Fairmont reaches a junction with Munz Ranch Road. CA 138 originally would have continued east towards Lancaster where as the El Camino Viejo and Stockton-Los Angeles Road turned south through Willow Springs Canyon towards Elizabeth Lake. Willow Springs Canyon is now traversed by Munz Ranch Road which is covered below in Chapter 10. Continuing from Chapter 9 once I reached Munz Ranch Road I ascended southward up Willow Springs Canyon into the Sierra Pelona Range. Munz Canyon Road quickly reaches a gap in Willow Springs Canyon approaching Elizabeth Lake. As mentioned in Chapter 7 looking north from Willow Springs Canyon one can see the Tehachapi Range and path to Old Tejon Pass in the distance. Cresting Willow Springs Canyon the path of Munz Ranch Road reaches Signed County Route N2 at Elizabeth Lake Road and Elizabeth Lake. Elizabeth Lake is a Sag Lake which caused by water draining into a sink in the San Andreas Fault. Elizabeth Lake lies at 3,228 feet above sea level and is partially in Angeles National Forest on it's western shore. Elizabeth Lake was originally called "La Laguna de Diablo" by the Spanish due to local lore stating that monster resided in the depths. The lake was renamed "La Laguna de Chico Lopez" after a local rancher in the 1840s. The modern name came from Elizabeth Wingfield who tripped and fell in the lake in 1849. Signed County Route N2 continues on Elizabeth Lake Road eastward where it junctions San Francisquito Canyon Road in Andrade Corner. San Francisquito Canyon Road quickly ascends the the relatively low 3,655 foot San Francisquito Pass. Considering the elevation of San Francisquito Pass is very low and the grades of San Francisquito Canyon are relatively gentle is no wonder that this was the primary roadway to San Joaquin Valley before the Ridge Route. Approaching the crest of San Francisquito Canyon traffic on San Francisquito Canyon Road southbound crosses a call box and is advised of 7 miles of downhill grades. San Francisquito Canyon Road is approximately 23 miles in length southward to Santa Clarita. San Francisquito Canyon Road makes a swift descent to Green Valley located at 2,936 feet above sea level. A Butterfield Overland Stage Station was located in Green Valley on the Stockton-Los Angeles Road and apparently still exists. San Francisquito Canyon Road in Green Valley does have an interesting junction with the oddly named Spunky Canyon Road in it's downtown section. San Francisquito Canyon Road continues to drop southward out of Green Valley before opening above San Francisquito Canyon above the pipelines of the Los Angeles Aqueduct. San Francisquito Canyon Road crosses under the L.A. Aqueduct pipelines along the west rim of San Francisquito Canyon. San Francisquito Canyon Road is a lot of fun to drive on as the grades are good and the road is just curvy enough to hold relatively high speeds. Immediately south of Forest Route 5N27 the route of San Francisquito Canyon Road intersects and older alignment which descends to the site of St. Francis Dam. The old alignment of San Francisquito Canyon Road was built following the demolition of the ruins of St. Francis Dam in 1929. The older alignment of San Francisquito Canyon Road was only replaced in the last couple decades and has quickly overgrown. The ruins of St. Francis Dam can be access by hiking the older alignment San Francisquito Canyon Road. The ruins of St. Francis Dam are just off the old alignment of San Francisquito Road and are easily identified by the grey ground up concrete. Some of the step design of the dam facade is still recognizable if only barely. The ruins of St. Francis Dam left a central section of concrete which was known as the "Tombstone." Considering there are 431 confirmed deaths related to the failure of St. Francis Dam it is no wonder the remains of the structure were demolished via explosive and jack hammer in 1929. St. Francis Dam was a 185 foot high concrete gravity dam which constructed by Los Angeles Department of Water and Power between 1924 to 1926. The General Manager and Chief Engineer of St. Francis Dam was William Mulholland who is mostly known for being the Chief Engineer for the Los Angeles Aqueduct. The St. Francis Dam was meant to supplement the Los Angeles Aqueduct by creating a reservoir along San Francisquito Creek with a catchment area of 37.5 square miles. Originally the designs for St. Francis Dam had the reservoir at only 175 feet high. The height of the St. Francis Dam was altered to 185 during construction to increase the storage capacity of the reservoir behind it. The roadway through San Francisquito Canyon crossed over St. Francis Dam from the west and used what is now Forest Route 5N27 to reach modern San Francisquito Canyon Road upstream from the reservoir. In total St. Francis Dam had a main structure length of 700 feet and 588 feet on the wing dike on it's western flank. St. Francis Dam had several notable leaks once the reservoir on San Francisquito Creek began to fill. While the leaks were thought to be normal at the time they never truly stopped despite spot repairs to the dam structure. On March 12th, 1928 St. Francis Dam had a catastrophic failure which released the entirety of the reservoir. As stated above 431 deaths have been confirmed as a result of the failure of the St. Francis Dam but it is unclear if there may be more victims. The failure of St. Francis Dam destroyed part of US 99/LRN 4 down stream on the Santa Clara River. 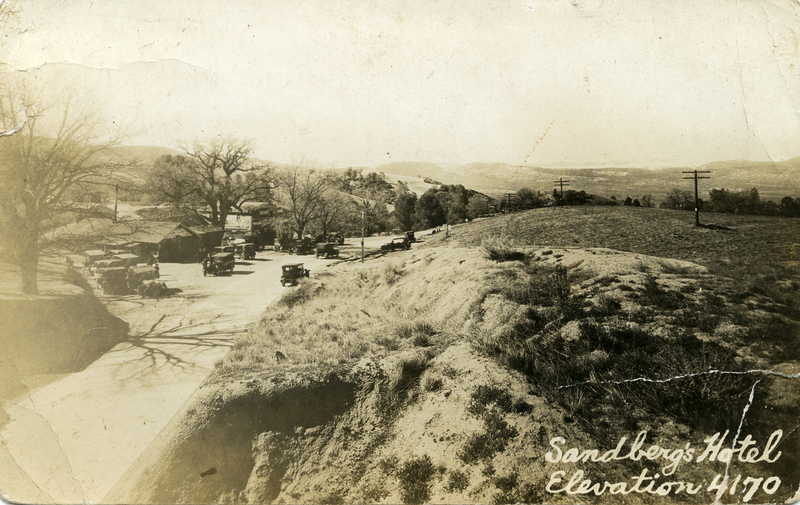 The flood waters largely destroyed Castaic Junction and flooded numerous communities such as; Valencia, Newhall, Saugus, Fillmore, Bardsdale and Santa Paula. The failure of the St. Francis Dam was largely attributed to ancient landslide materials on the eastern abutment of the structure. Secondarily the increased height from 175 feet to 185 feet has been speculated to played a factor in the failure of St. Francis Dam. Investigations at the time deemed the deemed the failure of the St. Francis Dam to be something that could have not been foreseen and cleared William Mulholland of criminal negligence. Despite being cleared William Mulholland retired later in 1928 and apparently lived in seclusion the rest of his life. Waterandpower.org has an extensive page full of photos on the failure of the St. Francis Dam. Returning to modern San Francisquito Canyon Road the modern alignment crosses through what would have been the western flank of St. Francis Dam. This photo would have been located just below the St. Francis Dam looking southward. The old alignment of San Francisquito Canyon Road can be seen on the left, the grey rocks strewn below is concrete from St. Francis Dam. Below the ruins of St. Francis Dam the route of San Francisquito Canyon Road crosses to the east bank of San Francisquito Creek. After crossing San Francisquito Creek the route of San Francisquito Canyon Road crosses paths with San Francisquito Power Plant #2. Despite the sign stating that the structure has been in place since 1920 that is somewhat misleading. The current structure is on the site of the original Power Plant #2 which was obliterated by the failure of the St. Francis Dam. The St. Francis Dam Disaster Historic Marker is located at Power Plant #2. San Francisquito Canyon Road follows the east bank of San Francisquito Creek out of Angeles National Forest and into the Saugus neighborhood of Santa Clarita. San Francisquito Canyon Road ends at Copper Hill Drive. San Francisquito Canyon Road originally continued all the way to Bouquet Canyon Road. Since the early 2000s Copper Hill Drive and Seco Canyon Road replaced San Francisquito Canyon Road to Bouquet Canyon Road. After completing San Francisquito Canyon Road I made my way into the Saugus neighborhood of Santa Clarita via Copper Hill Drive and Bouquet Canyon Road. I stayed headed south over the Santa Clara River via Bouquet Canyon Road which even on the earliest topographical of area I could find from 1903 is shown as the right-of-way from San Francisquito Canyon. As Bouquet Canyon Road crosses the Santa Clara River it picks up Soledad Canyon Road which was part of US 6 and LRN 23. LRN 23 was largely defined during the 1909 First State Highway Bond Act had it as running from Saugus north to Bridgeport in Mono County. LRN 23 would have met LRN 4 at the corner of Magic Mountain Parkway and Railroad Avenue about a block south of Soledad Canyon Road. Originally LRN 4 and US 99 would have entered Newhall on Railroad Avenue. LRN 4 and US 99 continued south over Newhall Avenue and San Fernando Road to Newhall Pass until the Weldon Canyon route was built. LRN 23 and US 6 were next signed through downtown Newhall but that only lasted until the Sierra Highway bypass was completed in 1940. After US 6 was moved Soledad Canyon Road/Bouquet Canyon Road were removed from the State Highway system while Railroad Avenue/Newhall Avenue became part of LRN 79. LRN 79 would eventually become part of CA 126 by 1964 and only recently was deleted from the State Highway system. Railroad Avenue and Newhall Avenue south through Newhall still resemble surface level State Highways. The rail crossing at the corner of Railroad Avenue and Newhall Avenue is especially hazardous given the at-grade rail crossing. It took a solid three minutes for a single car train to pass and for traffic to clear. I turned southward from Newhall Avenue on Sierra Highway which was the original path towards Newhall Pass. The Sierra Highway south to Newhall Pass is still four-lanes with a center turn lane. US 6 was cut back to Bishop during the 1964 State Highway Renumbering and the Sierra Highway became part of California State Route 14. According to CAhighways.org the final stage of the CA 14 Antelope Valley Freeway was opened from Newhall Avenue south to I-5 between 1973 and 1975. Ahead is looking south is where the Newhall Tunnel was located. Looking back north at Newhall Pass there is no evidence of a tunnel with the massive cut in the rock. Off to the side of the Sierra Highway there is a couple pieces of the Newhall Tunnel behind a fence line. What's left of Beale's Cut can be seen above the remains the Newhall Tunnel. Beale's Cut partially caved in during the 1994 Northridge Earthquake. There is a "City of Santa Clarita" sign located at Newhall Pass on Sierra Highway. Santa Clarita is a City that was merged from; Newhall, Saugus, Valencia and Canyon Country in 1987. Santa Clarita has been exploding in population since incorporation and recently surpassed 200,000 residents. Sierra Highway crosses under the CA 14 Freeway before meeting I-5. West of I-5 is The Old Road where US 6 would have met US 99. Back in 2016 I pulled off of I-5 at the Templin Highway exit to access the remaining section of Ridge Route Alternate on Golden State Highway north to the Pyramid Dam. Looking southward it is easy to see where Ridge Route Alternate would have merged into I-5. Looking northward on Ridge Route Alternate the expressway grade is obvious and devoid of traffic. Ridge Route Alternate continues north as an active roadway on Golden State Highway to a gate at Frenchman's Flat Campground. Ridge Route Alternate on Golden State Boulevard can be hiked all the way north to the Pyramid Dam. The highway bridge over Piru Creek entering Piru Gorge displays a build date of 1951. Below Ridge Route Alternate enters Piru Gorge on a somewhat haggard two-lane configuration. The second photo was taken from approximately the same location in 1960 when US 99 was on a four-lane expressway. Ridge Route Alternate approaches the Pyramid Dam where it disappears. The alignment of Ridge Route Alternate is now behind a 386 foot tall dam far under the waters of Pyramid Lake. The two photos below are from Ridge Route Alternate in what is now Pyramid Lake. The first photo is from 1935 and the second is from 1934. Chapter 13; Interstate 5 over "The Grapevine"
The final chapter of this series is on the modern grade over Interstate 5 from California State Route 126 north to California State Route 99. I started by approaching I-5 northbound from the east terminus of California State Route 126 at the edge of the City Limit of Santa Clarita. Santa Clarita was incorporated in 1987 and is made of the formerly independent communities of; Newhall, Canyon Country, Saugus, and Valencia. North from California State Route 126 the first northbound exit on I-5 is at Hasley Canyon Road which is at exit 173. Bakersfield is signed 74 miles north of I-5 exit 173. Exit 176A enters Parker Road whereas Exit 176B enters Lake Hughes Road. North of Lake Hughes Road the southbound lanes of I-5 cross over the Northbound Lanes. The northbound lanes of I-5 were built over the alignment of Ridge Route alternate until the southbound lanes cross back over. The northbound lanes of I-5 cross back over the southbound and enter Angeles National Forest. As stated above the Templin Highway at Exit 183 accesses the remaining portion of Ridge Route Alternate at Golden State Highway. I-5 continues between the alignments of Ridge Route Alternate to the west and the Old Ridge Route to the east. While ascending between the Ridge Route alignments I-5 intersects an access point for Pyramid Lake at Exit 191 at Vista Del Lago Road. I-5 northbound continues climbing above Pyramid Lake where it picks up the former alignment of Ridge Route Alternate on Smoky Bear Road at Exit 195. North of Smoky Bear Road I-5 northbound ascends above 3,000 feet above sea level and exits Angeles National Forest. At Exit 198A I-5 northbound meets California State Route 138. At Exit 198B I-5 meets Quail Lake Road. Gorman is signed as being 3 miles north of California State Route 138 whereas Bakersfield is signed as 48 miles away. Approaching Gorman traffic on I-5 northbound is advised of 5 miles of 6% downhill grades in Grapevine Canyon. Exit 202 on I-5 northbound enters Gorman. I-5 northbound has a Rest Area three miles north of Exit 202. I-5 northbound crosses over the 4,000 foot line and approaches the 4,144 foot Tejon Pass. At I-5 northbound Exit 205 there is access to Cuddy Canyon via Frazier Mountain Park Road. North of Exit 205 I-5 northbound enters Kern County in Lebec. The Rest Area in Lebec doubles as a Brake Check Area. Exit 207 on I-5 northbound provides direct access to Lebec Road. North of Exit 207 Bakersfield is signed as 39 miles away. There is another advisory sign about the 6% downhill grade through Grapevine Canyon. I-5 northbound Exit 210 accesses Lebec Road and Fort Tejon State Historical Park. I-5 northbound begins to descend into Grapevine Canyon. Trucks are directed to follow a 35 MPH speed limit and stay in the right lane. There are multiple runaway truck lanes on both sides of the Grapevine Canyon Grade. I-5 northbound emerges out of Grapevine Canyon into San Joaquin Valley, the former Ridge Route alignment can be seen below on Grapevine Road. Exit 215 provides access to the community of Grapevine. I-5 northbound Exits 219A and 219B intersect Laval Road in Wheeler Ridge. Exit 221 on I-5 northbound is the junction with south terminus of California State Route 99. I-5 continues west through San Joaquin Valley whereas California State Route 99 traverses the eastern edge. I must say that I am very disappointed that other people that have worked hard on actually preserving and protecting the roadway, such as Harrison Scott and myself, Michael Ballard, get no mention or credit in this post. You go out of your way to mention three sites, two of which have little to do with the roadway specifically. My site has been up since 1995 and has had a tour of US 99 and the Ridge Route since then. It is almost as if you went out of your way to ignore the work of others rather than collaborate or even bother to tell others of the work. You have got to be kidding me. Your reply is insulting and disingenuous at best. You don't even get the site right. I have worked for years, as well as others, and you purposefully snub that work and ignore it. Dying hobby? Not hardly. So, if after a "quick search", you found others that have done research, you didn't bother to contact them or even make them aware? Yeah, rather annoyed at being snubbed involving something I hold near and dear to me. Something I have been involved in for at least half my life. You still don't get it. No. I am not speaking for the Ridge Route group. I am speaking for myself. Try not to assume. You mean to tell me that you didn't bother to do a simple internet search to see who else might have done work regarding this topic? Only afterwards, when someone pointed it out? Makes me question your research abilities and your claim of only trying to help. Rather disappointing. Ridgeroute.com is also not the site for the ridge route group. If you truly wanted to help, you might have actually done this simple research prior to posting.